Our initial planning for Albania indicated that cycling into Tirana would be a behemoth task, rumours of over congested ring roads and maniac driving led us to take the decision that, as much as we might wish to, we would skip touring the capital. In this instance, our long recovery from food poisoning had a silver lining. While resting up in Durres and rebuilding our strength, we decided to take a furgon to Tirana for a day. No bicycles in crazy traffic = no problems! Furgons are ten a penny in Albania and are the mode of transport used by the majority of people for short trips. A furgon is a 14-seater minibus usually and in most towns and villages, there will be at least one point where they conglomerate to pick up and drop off passengers. They are generally a tumult of noise and activity, each furgon will have a representative, trying to lure custom for his vehicle. This comes in the form of a man hollering the name of the destination 3 or 4 times in quick succession, over and over again. And so, finding our furgon to Tirana was easy. “Tirane! Tirane! Tiranaaaaaaa!”, the young mans advertisement of transport could be heard from seeral hundred metres way, and so we hopped on the minibus. The drawback with furgons, sometimes, is that you must wait until the bus is almost full before it departs, and we were some ofthe first on. However, oer the next 15 minutes or so, more and more people arrived until the driver as happy with his load. And off we rocketed. These guys drive as if they have been told that he last person to reach Tirana is a rotten egg. Ducking and diving around other vehicles, only to grind to a halt that throws you back in your seat so that they can pick up goods or people at a random underpass along the highway. And so we hurtled towards Tirana at breakneck speeds, several random loading and unloading stops until we reached the ringroad where everything came to a complete standstill. Three lanes of traffic vied for top position; cars, furgons, buses and carts all trying to reach the city centre as soon as possible and everyone getting nowhere, fast. After 20 minutes of crawling along, the driver indicated we had reached the last stop, where the ring road joins the city centre. After a brief glance at google maps, we headed towards Skanderberg Square to see what Albania’s capital city is all about. As we negotiated our way through the city streets, our first impressions were of a city where the old buildings are rapidly disappearing. So far, we have noticed a certain Albanian penchant for things shiny and new; cars, jeeps and buildings. For people so long caught up in the illusions and restrictions imposed by Enver Hoxhas communist regime, I can only begin to imagine the draw that was felt towards material goods that were completely forbidden for decades. This penchant for spanky new items has sadly not been extended to footpaths, roads and lighting and our walk towards the city centre involved much pothole dodging and jumping over gaping chasms in footpaths. We reached the National Historic Museum, identifiable by it’s mahoosive communist mural gazing over Skanderberg Square. We paid our entry and wandered round the cavernous halls, gazing at artefacts ranging from the stone age right up to the communist era. The exhibitions on all the exhibits had been translated to english. All those, that is, except for the exhibitions outling the details of life and labour camps under Enver Hoxha’s regime. We were extremely disappointed. I love an aul bronze age spearhead as much as the next person, but what I really wanted to learn about was Albania’s recent history. Without any translation of the displays, it really meant very little to us, and I feel like we missed out on some insight into how people lived under communism here. We left feeling a little bit cheated of an education! By the time we left the museum, it was most definitely coffee time and so we headed to ‘Il Blokka’. Under communism, everyone was equal, except of course those that were better than everyone else. This included Communist Leaders and their buddies, who lived in the part of Tirana known as ‘the block’, no commoners were allowed to enter this area and it was a closed shop, accessible to only the elite of society including Hoxha himself. 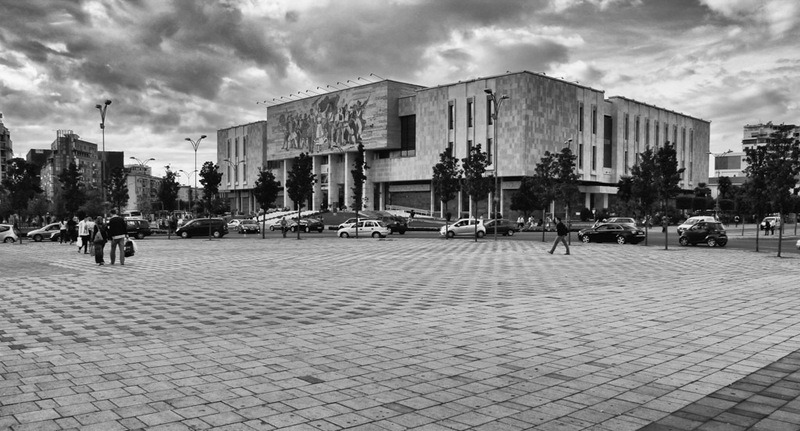 This area hs now been transformed into the hippest, coolest part of Tirana, where the young and trendy kick back and relax and party the nights away in the myriad nightclubs here (You can tell by my use of the word trendy that I am neither cool nor hip). It’s a great spot for people watching and each little cafe has a quirk of it’s own; hundreds of colourful plant pots scattered around, canopies provide shade made of dozens of umbrellas, moustache themed cafes…… you get the idea! After satisfying the coffee demons, it was time to answer the stomach rumblings and we set off in search of AFC, Albania Fried Chicken. We have been informed it is an institution here and after locating it, noticed that it is pretty much KFC, just substitute the word Kentucky for Albania and you’ve got yourself an exact copy of the original. It wasn’t good, or even ok and we regretted the decision to eat there as soon as our food appeared but managed to ingest it all nonetheless. With all our refuelling complete, it was time to go and see more sights. And so we found our way to a small park in the city known as Postblok. 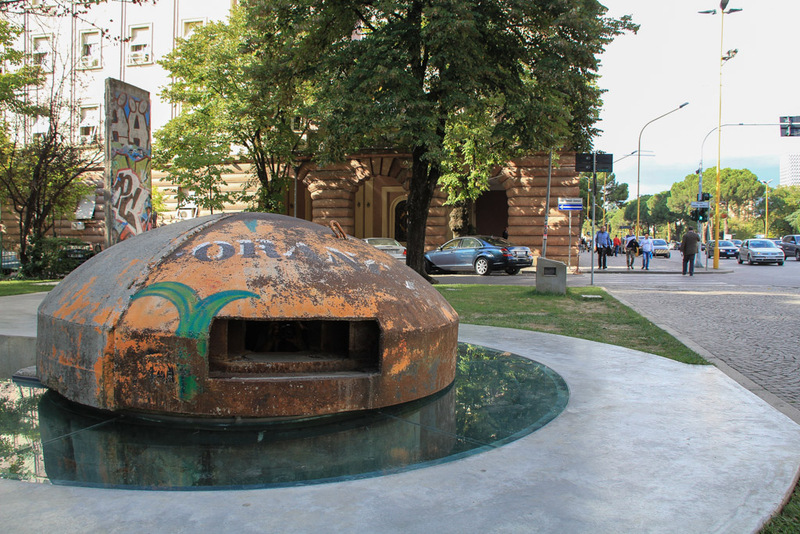 At the northern edge of the park, there is a small painted ‘mushroom’ bunker of the kind that were built in their thousands throughout Albania in order to protect the country in case of invasion. Inside the bunker, where there is only room for one person, you can look out the tiny gap at some concrete pillars that were brought here from Spac Labour Camp. Doesn’t sound too bad does it, a Labour Camp? “Ooooh, we’ll go to a Labour Camp for the holidays darling and do some arts and crafts!” But labour camps were where people who opposed or upset the regime ended up, disappeared into a world of slavery,often never to return to the real world. Also among the bits and bobs scattered around was a section of the Berlin Wall, interesting but I wasn’t entirely sure of it’s relevance in this context. Then we turned our head towards Piramida. One of the great things about communism here is that nobody had more rights and opportunity than anyone else. Unless you happen to be Enver Hoxha’s daughter. In which case, someone will hand you and your husband an opportunity to design a building, more expensive than any other in your country, to the design of your preference. These guys REALLY liked triangles it would seem. Piramida does what it says on the tin, it’s a massive pyramid made of concrete and glass and housed a museum to Hoxha during communist rule. These days, it’s a crumbling, grafitti covered ruin, a reminder of decades past standing amid a new and shiny city where the government are not quite sure what they should do with it. 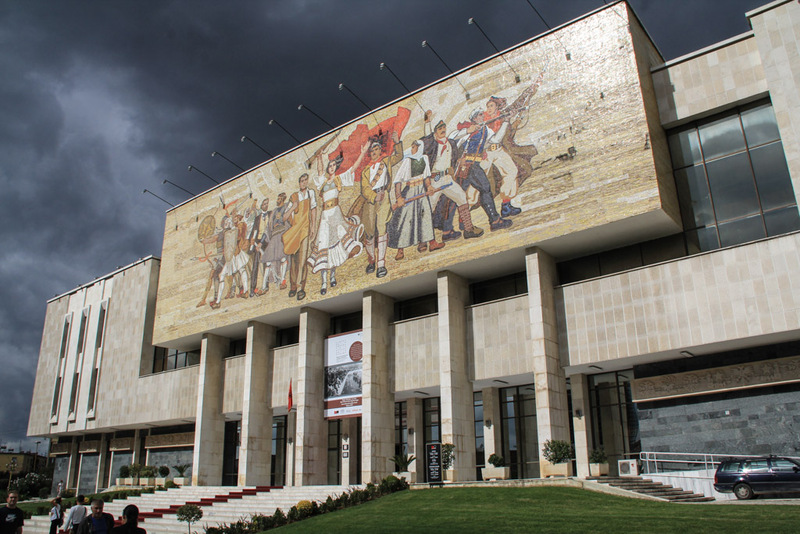 It has been proposed that the building should be demolished and a new cente for parliament built there, however, this building divides opinion both here in Albania and further afield. Plans to knock it down have been met with petitions headed by world famous architects while others support it’s demise. 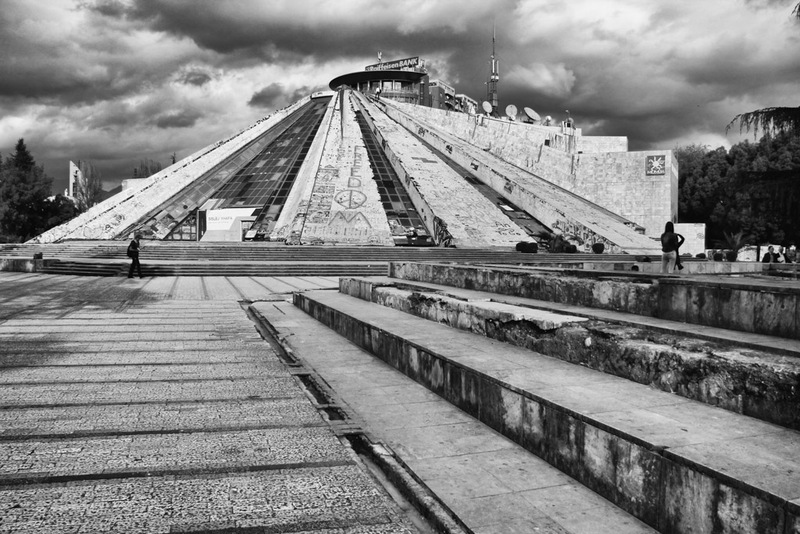 Either way, for now it stands in all it’s concretey glory awaiting a decision on it’s fate. After a good dose of Communist history, it was time to look a little further back and we walked to Et’hem Bey Mosque. 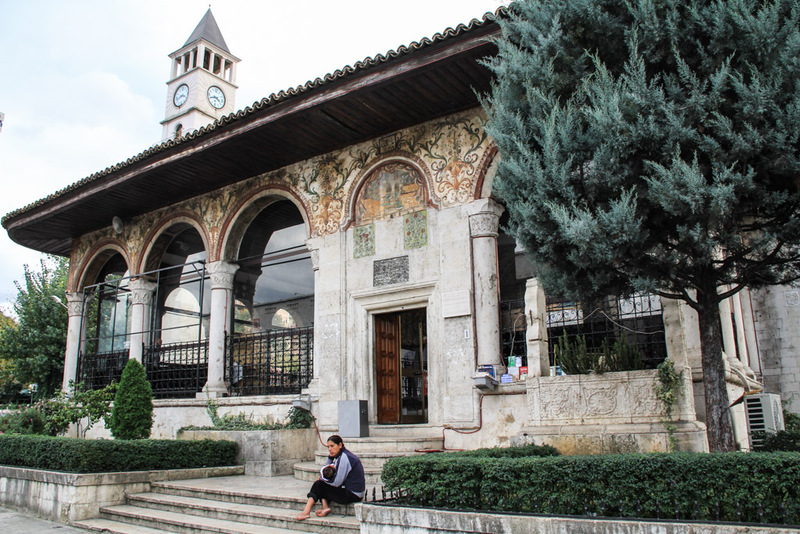 Dating from 1821, it took almost 30 years to construct and is considered the most beautiful Mosque in Albania. It is decorated elaborately in beautiful colours and while we were there, the call to prayer echoed across the city. While the crowds came faithfully to answer the call, we headed a little further north to Skanderberg Square. Fittingly enough, it is a park with a massive statue of the national hero astride his trusty steed. It’s in the centre of some very busy thoroughfares and so beyond a few snaps of the monument, there wasn’t much else to see here. 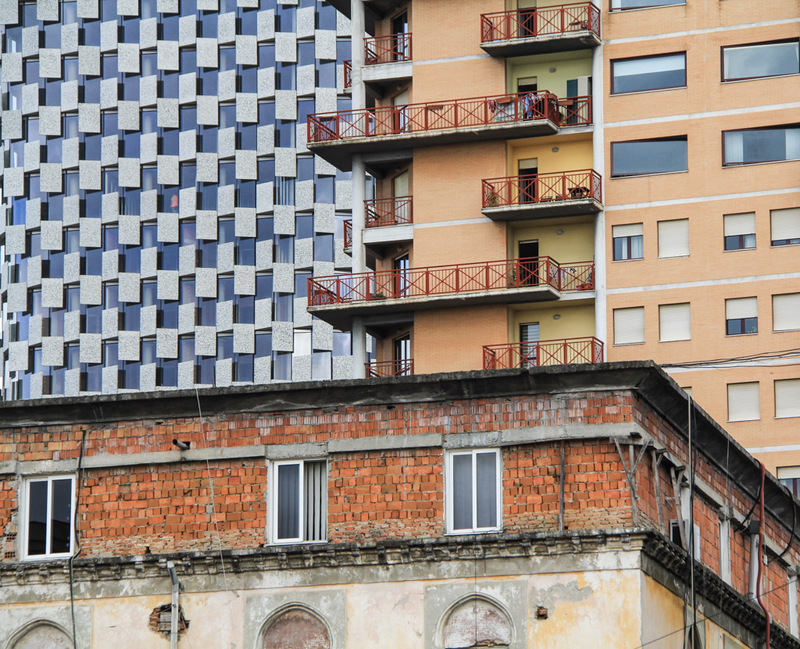 Throughout Tirana, we have caugh glimpses of the much famed, colourful tower blocks. These are the brainchild of Edi Rama, mayor of the city for 2 terms that began in 2000. The parisian trained artist decided that in order to brighten up the grey, towering communist blocks, it would be worth investing in a few coats of paint. Unfortunately, Edi’s paintings have not aged well. The colour has faded dramatically leaving his project looking somewhat drab. Maybe it’s time to reapply a few coats to reinvigorate this busy city. Our final stop for the day was an attempted peek around the back of the Arts Gallery. The gallery houses some apprently interesting socialist and communist paintings. But what really attracted our interest was the small collection communist statues that have been stored here since the 1990’s. 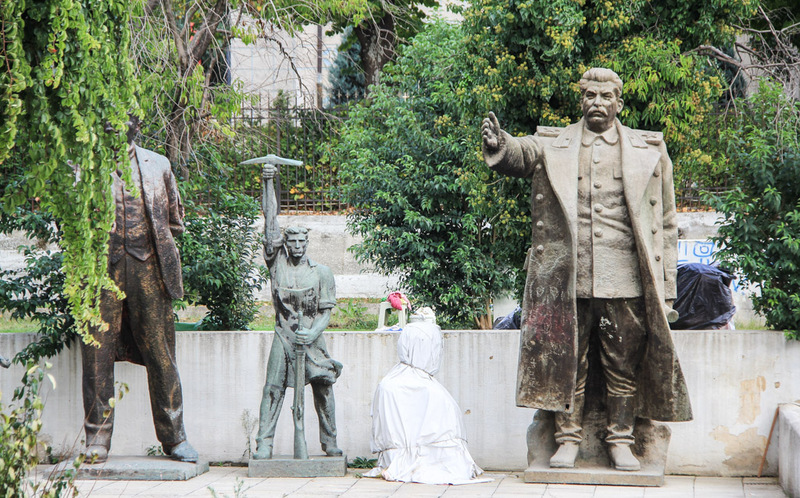 An aged but enthusiastic security guard shoed us away from the fence, but not before we managed to click a few quick pictures of Lenin, Stalin and Hoxha keeping one another company to the rear of the gallery. Our final plan for the day was to visit Mount Dajti but with the evening rapidly approaching, decided it was time to locate a furgon and get back to Durres. The view from Mount Dajti towards Tirana is supposedly fantastic.Not only that, but there are great opportunities for hiking in the National park. What’s more exciting is that you reach the top, at over 1600m, via cable car. 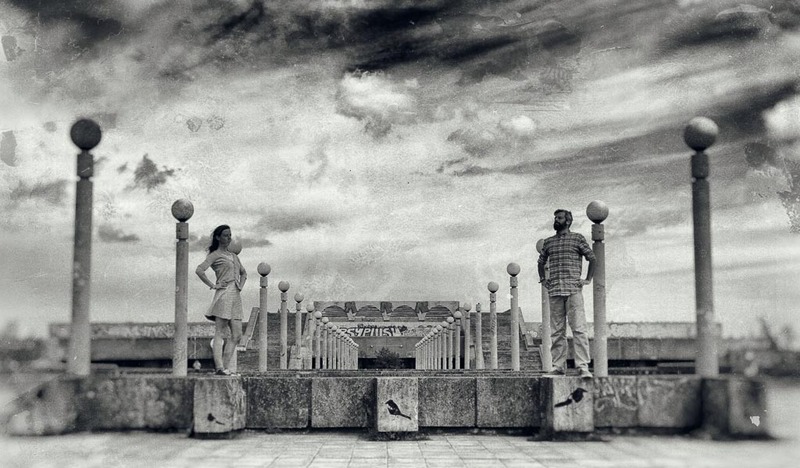 Oh well, maybe we’ll get to visit it next time we’re in Tirana! As we hurtled back towards Durres in our Furgon, we reflected on the day we had. Cycling into Tirana would have been nightmarish, but we enjoyed seeing it’s sights. Behind it’s hair-raising driving skills and broken footpaths lies a lively city, with a bit more work and another lick of paint (Yes, Edi, I’m talking to you! ), Tirana will surely become a thriving destination in the coming years. 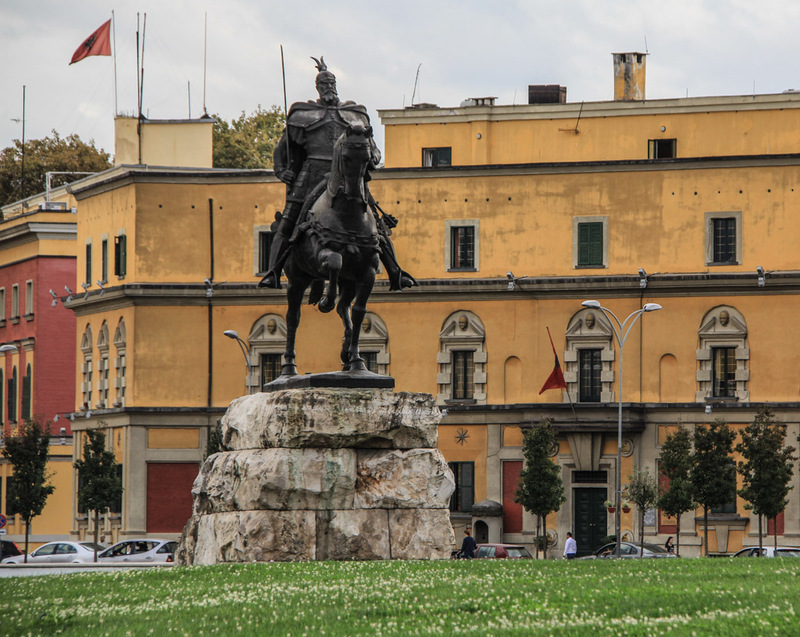 ← Stumbling upon Albania’s military past….